WASHINGTON, D.C., USA, February 12, 2019 /EINPresswire.com/ — On the 40th anniversary of the overthrow of the monarchic dictatorship, the main opposition said that the ruling clerical system "is at its weakest point in history," and the prospects of change are shining brighter than ever before. 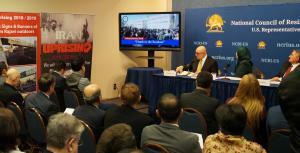 The U.S. Representative Office of the National Council of Resistance of Iran (NCRI-US), sponsored a panel on Monday, February 11, 2019 to discuss the regime’s long and brutal domestic and foreign policy record at home and abroad. Soona Samsami, the NCRI's representative in the U.S., offered an in-depth examination of the current situation, including major crises that the regime is facing, and struck a note of optimism about prospects for democratic change in Iran. "The Iranian people are calling for the establishment of a republic, based on democracy and separation of religion and state," she said. "In contrast to the regime's attempts to paint a picture of strength on its 40th year in power, in reality it is at its weakest point in history." She cited deep-rooted corruption, large-scale embezzlements by officials, millions of poverty-stricken Iranians, the national currency's rapidly falling value, and the unprecedented decline in citizens' purchasing power as indicators of a rotting theocracy. On that day, "the Iranian people toppled the Shah’s dictatorship known for his notorious secret police, SAVAK, the infamous Evin prison, and the lavish spending of his corrupt regime," said Samsami. 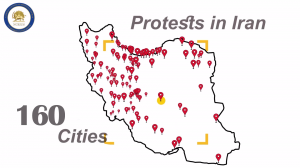 The panel also featured a video compilation of scenes of massive protests in 2018 and 2019, which encompassed more than 160 cities and towns in all of 31 provinces in Iran, dealing the greatest security shock to the mullahs to date. Former State Department official and ambassador to Bahrain, Adam Ereli, spoke at the well-attended event at Washington's National Press Club. "Looking back on forty years of revolution: Yes, the mullahs are still there, but so is the MEK," said the ambassador, referring to the main opposition Mujahedin-e Khalq (MEK). 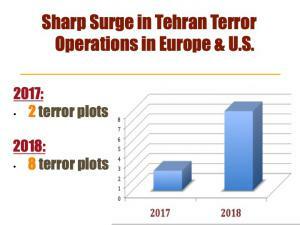 Ambassador Ereli added that the fact that the regime's senior leaders, including Khamenei, IRGC commanders and Rouhani, continue to slam the MEK "validates and substantiates the impact that this organization has had and continues to have." "From the American side, I would simply argue that you've got a very capable opposition." And, "the best thing the U.S. can do is to just stop appeasing the current regime," said Ereli. Ali Safavi of the NCRI's Foreign Affairs Committee chronicled what he described as the ineffectual Western policy vis-a-vis the mullahs over the past four decades, starting with the early 1980s, saying: " Everything [in the West's policy] begins with the regime and ends with it. Lost in this approach have been the Iranian people." Western outlook amounted to a "policy of appeasement" that has actually "helped prolong the mullahs’ rule," he added. "The right policy is to recognize the rights of the Iranian people and the organized opposition to overthrow this regime. Unlike Syria and other countries suffering from dictatorships, Iran has a historic, real and viable alternative," Safavi said. Safavi added that the policy of appeasement toward the mullahs included the unjustifiable blacklisting of the MEK by the U.S. in 1997 as a "goodwill gesture" to Tehran. The energy of this attitude continued to propel appeasement policy during the Obama years, when the administration tragically turned a blind eye to the 2009 protests in Iran and also the massacre of MEK opposition members in camps Ashraf and Liberty in Iraq. 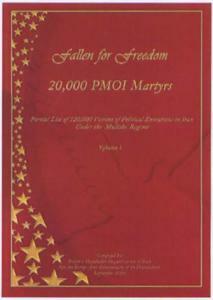 At the same time, the regime has launched an extensive demonization campaign against the MEK. Speakers cited 19 movies, drama series and documentaries produced by the state to tarnish the MEK's image in the minds of the youth. "In 2018 alone, 18 major books were published by the regime against the MEK, bringing the total over the past few years to 519," said Samsami, with other speakers pointing out that the regime's vilification campaign extends to some in the U.S. and the West, including those directly paid by regime affiliates. 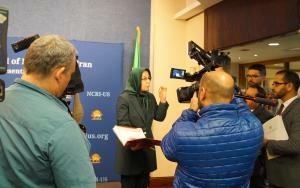 Samsami said: "The NCRI's President-elect, Maryam Rajavi, represents the demands and aspirations of the Iranian people and protestors in recent years. Units of Resistance posted her pictures in major highways and street corners." "Mrs. Rajavi's 10-point plan for Iran's future includes policy formulations like: separation of church and state; abolition of the death penalty; universal suffrage and elections; gender equality; peace and co-existence with neighbors; and freedom of the press and speech." Safavi concluded: "Recognition of the NCRI as the sole democratic alternative to the terrorist religious dictatorship in Iran is the imperative to rectifying and ending the disastrous policy of appeasement over the past four decades."